The tagline of my new favorite parfum, Étoile, from the Fragonard Parfumeur really resonates with me and describes how I have been living in Paris. While I generally have goals, a basic itinerary and places to visit each day, I am allowing spontaneity to direct me. In some ways, I feel that living spontaneously has been my lucky star. Every day after French class, I leave in a new direction to explore the surrounding neighborhoods of Paris. 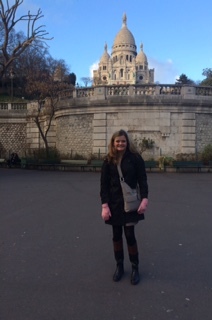 My adventures started in L’Opera district, Notre Dame, and Montmarte last week. I also spent the weekend on a Seine River cruise, wine tasting at O’Chateau (I highly recommend this to you! ), and trying tapas in the Montorgueil neighborhood. This week, I have had no official plans and have stumbled on some very intriguing areas and interesting experiences. Starting on Sunday, I went on a run from Pont Mirabeau along the Seine River towards the Eiffel Tower. I stumbled upon dozens of tents selling antiques. It was amazing to see antiques (furniture, paintings, jewelry, trinkets, and more) that were from as early as the 1500-1600s. I was most struck by letters written from the last two centuries, capturing brief moments in Parisians’ lives throughout history. I knew that antiquing was popular in the United States, but not in Paris! I told my host family about this and they said that antiquing is a trend in Paris, and you can actually find pretty affordable items at these markets. While at this point I am not ready to buy antiques, I will remember this when I am decorating my future home. Yesterday, I planned to walk to Champs d’Elysses after class. En route, I found several cute boutiques and luxury stores and let myself get distracted. With the soldes happening until the beginning of February, it is the ideal time to shop and plan what you will need in the coming months, because soldes only happen twice a year in Paris. I shopped for clothes for my nieces at Chocolat et Tartin (couldn’t resist the most stylish toddler clothes I have ever seen) and had some luck at Zara. I bought the cutest, most Parisian party shoes that I could find, along with a new black top and washed jeans. I then came across Chaise Longue, which has become one of my favorite places to buy cadeaus for family and friends. The best word I can think of to describe it is quirky, with interesting and unique gifts that are destined to make my loved ones chuckle. I bought an adorable Parisian umbrella and gifts for my parents, which I can’t reveal in case they are reading this :). 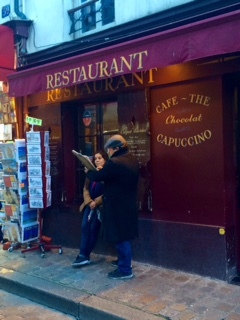 One of my new expat friends, Chen, stopped by to show me Parisian highlights near L’Opera district. We walked along the Seine River to Pont des Artes, Place St. Michel and through Quartier Latin, which was so lively and welcoming. I was inspired to have a sunset picnic like the locals when mon copain visits me in March. It was interesting to learn from a Chinese-turned-French citizen about living in Paris and previously studying at the University of Lyon. Brag moment: we spoke almost the entire time in French! Imagine a native Mandarin-speaker and a native-English speaker communicating in French; I’m sure the locals were confused if they overheard us! With all the walking, I was starving, so I stopped for une tarte de framboise and un verre du vin rouge. It was the perfect way to end the day and people-watch in Quartier Latin. Today after class, I again planned to visit Champs d’Elysses. On my way there, I came across the Musee de Parfum, Fragonard. I learned that there were free museum tours and was intrigued. I entered the museum, and without realizing it at first, joined a tour group of French senior citizens (mostly women) for a French tour of the museum. I am sure I was out of place, but no one said anything (despite a few glares), and it was interesting to learn about the museum in French to test my comprehension. The tour guide explained the history of the creation of perfume, and specifically Fragonard parfum starting shortly before the First World War. I learned about the olfactive triangle, which was fascinating to discover that a parfumeur is like an artist, combining different levels of scents that appeal to the nose. It was interesting to learn that the founder, Eugene Fuch’s intent was to encourage tourists to take home a “scent of France” from their travels. I was easily convinced to be one of those tourists. At the end of the tour, we were able to sample several fragrances, and I fell in love with the first one, Étoile. I purchased eau de parfum and body lotion. Upon leaving the store, I noticed a crowd of women near stems of what looked like yellow flowers or pines on the ground. One of the ladies informed me that the museum was throwing away extra sprigs of mimosa and we were free to take them. I left the museum with new parfum and a bouquet of mimosa. I’m sure I looked silly carrying freshly cut mimosa flowers as I continued walking throughout the streets of Paris towards Champs d’Elysses. My next discovery was a beautiful park near the Grand Palais (which is another site I hope to visit soon). I sat on a park bench and enjoyed the fresh air. I was reminded of the importance of pausing and reflecting – it is easy for me to forget to do this in my daily life in the U.S.
Alas, I reached my desired destination of Champs d’Elysses. At this point I was starting to feel exhausted and was carrying a bouquet of mimosas, which limited me from doing a lot of shopping. I did, however, walk by the Renault store, which sparked my curiosity, because I have studied international business strategy cases about Renault in my IMBA program. I decided to enter the store. Right away, I noticed that their front display included Michelin tires, which was exciting for me as they will become part of my daily language this summer. The next displays showed the latest electric cars and highlighted that Renault sells the most electric cars in Europe. I was impressed to see that the store had a restaurant for customers to relax and recharge while shopping for new vehicles. Who knew that one afternoon in Paris could combine learning about the history of parfum and the future of mobility and electric cars? C’est la vie de la spontanéité! I truly believe that I have had such diverse and exciting experiences because I have enabled spontaneity in my new Parisian life. I am going to continue follow my lucky star, which is a spontaneous, cheerful, and grateful path to being inspirNational in my daily life. Approaching my first two weeks abroad, I already feel that I have had substantial time to reflect on my adventure in Paris. As expected, I have learned a great deal about the French language and culture while in class, living with my host family, visiting tourist sites, and exploring the city. More significantly, though, I have learned about myself and how I can apply my Parisian mindset to my daily life. Below I have captured some of the key lessons that have enlightened me while living abroad in Paris. Eat to enjoy, not to indulge. Many Parisians eat bread and cheese at every meal, and chocolates or pastries after every lunch and dinner. Most of our waistlines are saying “no fair! How is that possible?” This seems contrary to all diet rules we have heard. I eat sweets almost every day now, including crepes with Nutella, creme brulee filled chocolate, coconut cookies, and chocolate waffles. One significant observation is that the portions are a quarter of the size of those in the United States. The smaller portions are encouraging me to enjoy each morsel, rather than feel full after eating sweets. My host sister told me that the average French woman’s BMI is 19, which is on the verge of being underweight. This reminds me that portion control is key. Rather than restraining ourselves and then indulging too much, we should allow ourselves to enjoy small portions and satisfy our cravings. Look to appreciate, not to just see. Notice differences between your new destination and your home, and learn from them! Tourists are often better at looking to appreciate than locals, especially because tourists experience a series of “firsts” when traveling: “first time seeing the Eiffel Tower,” “first time cruising on the Seine River,” etc. For those living abroad, it becomes easy to overlook our surroundings. We may walk past monuments without appreciating their history. Or we may drive home from work when the sun is setting without noticing the beautiful sky. With the opportunity to visit Paris a second time, and now fully engage with the city as a student, I am focused on appreciating all of my surroundings. I am taking several photos to capture memories. I am reading every sign and researching the significance of the buildings, monuments, and streets around me (centuries of history I should mention). This appreciative outlook is helping me become more understanding of the French culture. I also feel more grateful for the small things that bring me joy and empowered to face adversity in my daily life. Listen to understand, not to judge. While traveling and especially while living abroad, we are constantly encountering new people, which means new perspectives. In various conversations, we will likely hear things that enlighten us, surprise us, or even enrage us when living abroad. I’m surprised by home many expats in Paris I’ve met who have said, “You’re American, why do you need to learn French?” Or “Why are you traveling in Europe? I thought Americans only stayed in the U.S.” I have chosen to listen to their questions respectfully and respond with my genuine interests and goals about learning French. I realized that according to this stereotype about Americans, I might be rare for having the travel bug, eager to learn new languages, and explore new cultures. Rather than judging their assumptions, I am working to be an American ambassador, demonstrating that many Americans do in fact enjoy learning about other languages and cultures. On a separate but similar note, traveling often forces us to take the role of listener. Particularly when we are learning a new language, we are still learning how to formulate words to contribute (confidently) to a conversation. This intensive listening is a good exercise particularly for those of us who often voice our opinions. Without having to (or being able to) speak, we become more understanding and less apt to make quick judgments in a conversation. Speak to communicate, not to fight. The world is full of hateful words, and it is easy for us to engage in a fight. We can be more effective by having the objective to communicate and foster understanding in a conversation. This became more apparent to me when I visited the Place Republique in Paris, which has a monument with a memorial for the terrorist attacks in January and November 2015. The memorial speaks volumes about the pain the French felt when attacked over the past year. Hundreds of candles, photos, poems, and letters surround the monument, voicing the Parisian’s sadness, values, and dreams for the future. The memorial has a way of communicating powerful words that inspire the world, rather than engaging in a fight. If we truly want to end the war on terrorism, we need to disengage from the “dirty fight,” respect each other, and not fall victim to the endless fear that terrorists are hoping to provoke. I have faith that goodness will prevail, especially if we can effectively communicate with eachother throughout the world. Live to experience, not to achieve. Every year, I have come closer to the realization that life is a series of experiences, and not necessarily achievement milestones. With the expectation that we will have a series of experiences (and not just accomplishments), we will no longer fear failure. One of my favorite quotes that I recently read was by Nikola Tesla: “I have not failed. I’ve just found 10,000 ways that won’t work.” We will go through ups and downs, all of which combine to create the experience of life. My time in Paris has been a great example of this “experience” mindset. My first weekend in Paris I went the wrong way on the metro a few times, but it made me learn the “ins and outs” of the metro before beginning school. My phone died a few times and I didn’t have a charger, but it reminded me to pause and look with my own eyes rather than the eyes of my iPhone camera and social media pages. Despite all the changes and new beginnings in 2016, I have a sense of calm within me, solely because I am enjoying considering both positive and negative moments as life experiences. 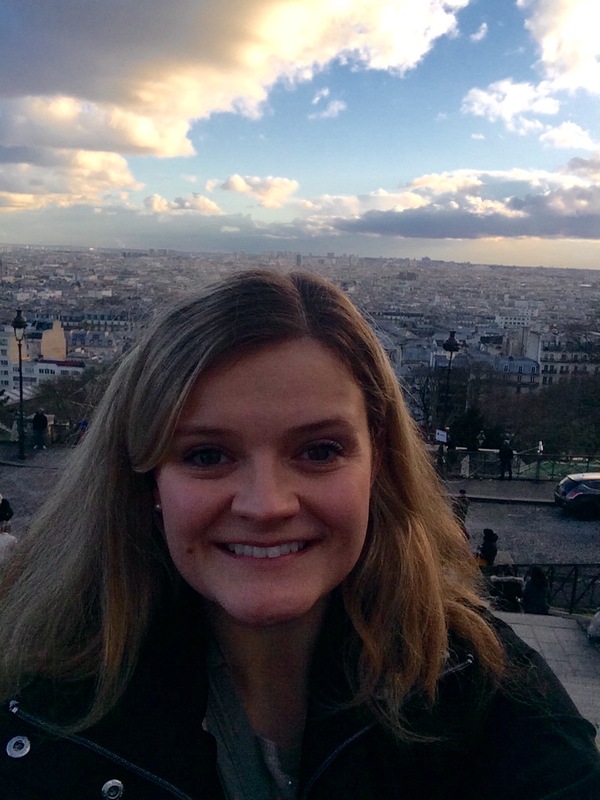 I hope these inspirNational lessons I have learned while living in Paris can inspire you too. What other enlightenment have you experienced while living abroad? 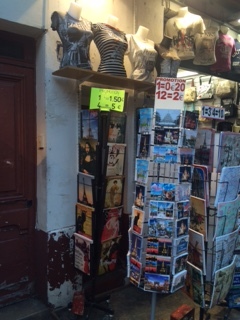 What can you buy for only €1.40 in Paris? It’s a Friday afternoon in Paris and you find yourself with €1.40 left in your wallet. What can you buy with only €1.40 (equivalent to around $1.80) in Paris? Nothing, right? Well, most would think that, but I was determined to continue to explore Paris after class today without having to go back to my apartment for more euros. How did I end up with only €1.40? Totally out of character for me since I always have at least the value of $20 wherever I go, along with a credit card. We all face traveler’s dilemmas, and today was my day of malchance. I was low on cash given my past couple days of cash-only expenses (side note to prospective European travelers: despite the modern world of credit cards, always have cash on you!). I went to lunch at EIX between classes and noticed that my credit card was declined. My first thought was that this was a security warning which often happens when traveling. I knew that I was well below my credit limit. I tried to call my bank but realized my new SIM card only calls French phone numbers (and my bank is in the United States). My friend recommended that I call the bank through Google Hangout. After Internet struggles, I finally got a hold of the bank through Google Hangout and they told me that there were no security holds on my account. I explained my situation and while the bank gave me a hard time, they finally realized that my card was dysfunctional, so they would need to send me a new card. Without a functioning credit card and only coins in my wallet, I felt doomed for afternoon exploration. But I really wanted to visit Sacre Coeur since it was only a 1-mile walk from where my school is located in L’Opera district. 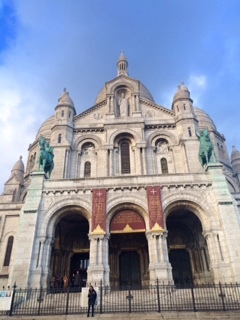 My adventurous side prevailed and I began the journey to Sacre Coeur. 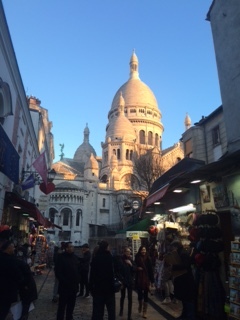 I walked through cobble stone streets that slowly started to elevate as I reached Montmarte. 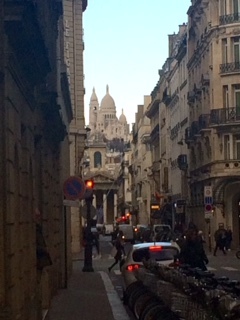 In the distance was the beautiful Sacre Coeur Basilica, which was breathtaking at this time of day (the sun was shining perfectly on it). I walked passed cafes and boutiques, busy with those arriving to Paris for the weekend. 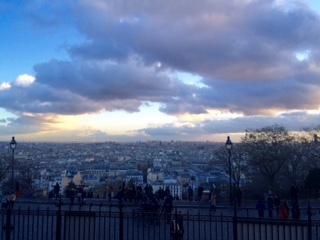 I walked up several flights of stone stairs, every so often turning around to see all of Paris around me. With each step came a higher and more beautiful view of the city. I was slightly frightened by very aggressive vendors who were trying to put string bracelets on me or have me sign petitions. I had to say “no” very forcefully in order for them to go away (side note to prospective European travelers: never stop to sign petitions! They are a sneaky way for people to pickpocket you or force you to pay them for the “cause” they are pretending to represent). Once I made it all the way to the top, though, I was separated from the vendors. I paused for a moment to enjoy the spectacular views and reflect. I felt so lucky to be standing there in that moment! 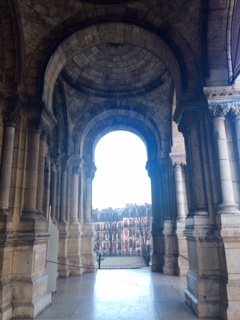 I decided to walk into the Sacre Coeur Basilica. As with the Notre Dame Cathedral, I felt an overwhelming wave of emotion that brought tears to my eyes. I looked at the beautifully painted ceiling with religious figures, specks of gold, and pews with hundreds of people praying. I sat for a moment to pray for my loved ones. I walked around, viewing statues and luminaries. I stopped by the St. Pierre statue and touched his foot, a common Catholic custom. Sadly, I was not allowed to take photos inside, but I encourage you to visit regardless of your religious interests. It was one of the most fascinating cathedrals I have seen, and I enjoyed seeing it even more the second my time (I first visited it with my mom in 2011). 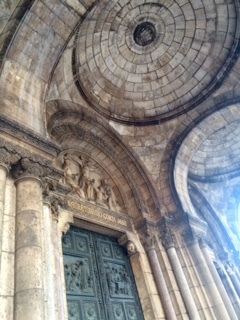 Departing the cathedral, I decided to wander around the artsy corners of Montmarte. Every store was either an art gallery or a cafe. Artists lined the streets, drawing pictures of the scenery and portraits of tourists (little did I know this would be significant to me a half hour later). Mon petit-ami called me via WhatsApp and we had a great conversation discussing my day in Paris, how beautiful it is in Montmarte, and his exciting new internship with the Attorney General in South Carolina. Sadly, our conversation was short-lived because my phone died. More malchance. At this point, I was without a phone or a credit card, and had only €1.40. 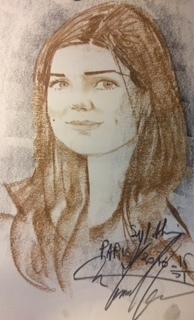 I must have looked helpless when an artist, Sylvie Alan approached me and said he would like to draw a picture of me. I told him “no, merci” politely “parce que ne j’ai pas argent.” He refused to let me walk away and started drawing my portrait. He said “if you don’t like it, don’t worry, I’ll take it back.” He was a fantastic artist and made me look way better than I think I actually look. He described how he lives in Montmarte and enjoys sketching pictures of the backs of women and portraits of tourists. I explained my crazy story of malchance to him and how I was studying in Paris for 3 months. A few minutes later, he finished the sketch and said in French, “normally I sell this for 45 euros, but you can pay whatever you’d like.” Little did he know that I was being honest that I had no money except for the coins in my wallet. He said “don’t worry about it, come back and buy me a glass of rose wine.” I knew that I would go back to Montmarte to pay him and visit again, as it quickly became my favorite destination in Paris. With all that I did not have (no phone, cash or credit card), at least I had a new portrait of myself. I luckily found a cafe that would let me charge my phone. I explained my story in broken French, and didn’t even have enough money to buy coffee. I will have to go back with un cadeau for the cafe owner’s generous help. I walked around on my way back from Montmarte desperately looking for something to drink that cost less than 2 euros. 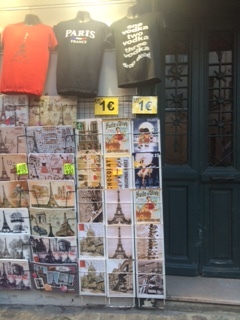 I found it funny that almost nothing to eat was that cheap, but I could buy a painting or post card for 1 euro! I finally stumbled upon a tourist cafe that sold espresso for exactly €1.40! Finally some bonne chance, and clearly a sign to help me get home with enough energy. A half-hour on the metro later, I am happy to say that I made it home. Now for a relaxing evening, dinner with my host family at 9pm, and a fabulous weekend ahead exploring the Parisian museums. Starting tomorrow, I will always have more than €1.40 in my wallet. It’s real! It only became real very recently…as I am now on the airplane and only 1 hour and 20 minutes away from Paris. I’ve spent the first few hours of my flight eating great food (kudos to Delta for the delicious dinner and breakfast, with healthy options, perfect portions, and my all-time favorite Biscoff cookies). I watched The Intern in French to get the French language gears moving again in my head. I’m currently listening to Brigitte “A Bouche que veux-tu” while writing. With reality sinking in, I finally feel excited. I’ve spent months preparing for my trip. From deciding whether I want to learn French, to studying basic French for the past six months, to undergoing the visa process, to packing from South Carolina to Michigan to now France, I am grateful to say that my trip has arrived! I will be studying in Paris at France Langue from now until April. I look forward to sharing my Parisienne insights on inspirNational! What are my expectations of myself in Paris? To grow bigger eyes and ears. I will be looking at every scene, every interaction and cultural event in front of me. I will be listening attentively to every word, every street sound, and every action in Paris to fully be able to learn the French language and how to be French. To sit at cafes and “people watch.” I am envisioning spending afternoons between classes eating a chocolate filled croissant, drinking espresso out of a tiny porcelain cup (according to American standards), and watching stylishly dressed people walking past me. This expectation is partly based on reality, as I experienced this in Paris during a Trafalgar tour in 2011. It is also the dream I’ve had about actually living in Paris. To appreciate the finer things in life. Based on my understanding of French luxuries, small but high quality portions of food, among other things, I am guessing that I will learn to appreciate having less, but better quality things in my life. Rather than ten purses, I may have only one, for example, such as Louis Vuitton (or as that just wishful thinking ;))? I expect to go shopping at stores that are beyond my budget, including the latest cutting edge fashion stores, best international cuisine restaurants, bakeries, and perfumeries. To me, French business automatically has a stamp of luxury and high quality, but also high prices. I’ll be curious to see if my expectations are reality. To become Parisienne. This may be optimistic, but I believe it is possible! I’m excited to live and breathe the French culture. I will be living with a French host family in the 16th district. I look forward to learning from them – the father is an ENT surgeon, the mother is a WWF director, and they have four children, one of whom lives with them. I have heard that their neighborhood is one of the wealthiest in Paris, so this will provide me with an interesting perspective. Friends have warned me that Parisiennes may be cold to me because I am not French, but I am going to challenge myself to blend in, be respectful, and use French as much as possible to hopefully have positive interactions with the Parisiennes. I am hoping that the homestay will help bridge the gap between being a tourist and being a local in France. For those of you have lived in France, what was it like living there and do you have any advice as I begin my journey? Merci et bon voyage!